It is fitting that we are gathered at the Ottawa Curling Club on a Tuesday night. Tuesday nights are Ladies Night. The lounge we are in is filled with banners and photos of women who have achieved so much in our sport and for our club. There’s an 81 year old photo in this lounge of a women’s team standing outside of the Ottawa Curling Club holding a trophy. It was a different era and a lot of clubs had different rules around gender at that time. In 1937 and for many years after women were not permitted to sit or celebrate where we are tonight. Here we are on a historic night in a room that is now decorated by the success of women. An entire wall and a half is dedicated to the incredible success of just this team. Tonight we’re sending Team Homan off to their childhood dreams. We’re also saluting an incredible run to get here. These last few seasons aren’t simply just a list of wins for Rachel, Emma, Joanne, Lisa and Adam. There were memorable moments. There were career defining moments that are now etched into curling’s history books. From the team’s triumphant walk down Sheet C in Cobourg to celebrate their fifth trip to a Canadian women's championship in just seven years, to Craig Homan’s arena concourse fist-pump celebration after watching his daughter execute a season-saving double takeout, to the still shot of the team embracing after winning a world title in Beijing, to that roar inside the Canadian Tire Centre when that goal horn blew to celebrate achieving one of their biggest goals, it has been a run with many well documented highs. Those goosebump-inducing moments are ones I’m not going to ever forget. However, the moments that will never make a highlight reel, record book or Wikipedia page also need telling. Tonight I wanted to touch on a few of those. I just found curling so boring and not enough action. Team Homan has always been a team I had watched as curling was always on in my family's house. It wasn't until this past weekend where something clicked and I started to really like curling. I know it was from watching you ladies play. Maybe it was from your friendship with each other and love for the game. Or maybe it was just from seeing a very skilled team like yours play in person, and realizing that curling takes a lot more than just chucking rocks down the ice. Whatever it was it got me hooked enough to talk to my high school curling coach and hopefully get me on a team. That young fan got on that team. He did so without asking for but receiving from Emma a custom-made Homan jacket with his name on the back to wear to those high school games. There was Sonia, the young curling camper the team met in the fall of 2016. Her mother wrote to thank the team. Sonia had channeled Team Homan's calm and cool Canadian final performance to help her team advance in school curling playdowns the day after that dramatic televised final. It wasn’t just young curlers who made me appreciate the impact of these ladies. Pam McCauley celebrated her 65th birthday by “living her dream” of watching Team Homan represent Ontario in St. Catharines. She was alone but bursting with excitement when I approached her in the stands and asked her if I could get a photo of her. Their compassion has no borders. Most curling fans have heard the story of Mexico’s Gabriella Fernandez. 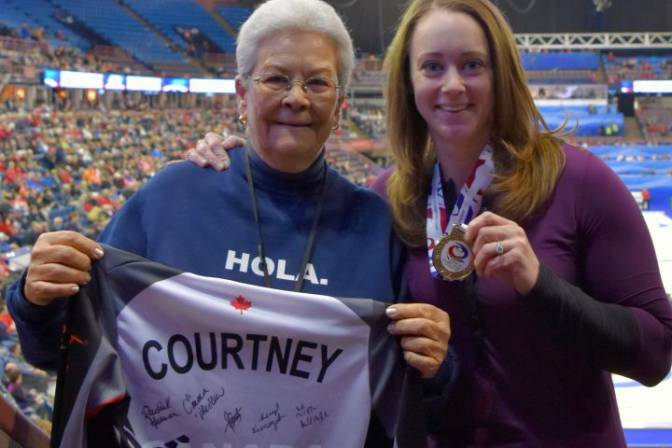 Last April she was able to make it north to Edmonton to attend just her second live curling event where Joanne ensured to link up with her again and give her a keepsake, this time from the Worlds in Beijing. There was that winter night when dozens of locals showed up at the Ottawa Airport to greet Team Homan as they returned home as World champions. There was a group of Getting Started League members who made the trek to the airport. Two years prior these new curlers, including one from South America, probably hadn’t even heard of this group of female athletes. They asked to touch Emma and Lisa’s gold medals for good luck ahead of their beginner league championship final the next evening. In that crush of Ottawa Curling Club members at the airport was Peter Glover and his family. Over a year and a half ago Peter was diagnosed with ALS. He could no longer curl or walk but still beamed with pride as he wore his 'Homan’s Heros' shirt from the 2013 Canadian Championship. Peter and his wife Pat were able to attend the Trials in December. But as many of you know, Peter passed away ten days ago. It is customary that teams headed to national championships representing the Ottawa Curling Club receive funding from the club and proceeds from a week-long 50/50 draw. It was Team Homan’s wish in 2017 that funding earmarked for them be diverted to Peter and his family to help with expenses as part of the Team Peter fundraising. The curling community is a close-knit one that when people come calling it is the players, teams and fans who give back and this team is no exception. I chuckle at the memory of Rachel exchanging banter with a caller into last year's Sandra Schmirler Telethon as they couldn’t believe curlers actually answered those calls. As the skipper was discussing her week of curling with the donor on the phone talking ice conditions, competition and previous championships, a young girl in the upper level of the arena in St. Catharines sheepishly positioned herself for her parents to get a photo of her standing next to the woman who would go on to become the youngest skip to ever win three Canadian titles. As Team Homan started their gold medal final at the 2017 World Championship in Beijing, a fan in Calgary was finishing a late shift. The fan tweeted she was staying the night to watch their game at work. As I searched for the tweet from that fan in reflecting on this, I stumbled across and was struck by this other tweet from that same fan back in January 2016, hours after Team Homan had lost the Ontario final. A reminder that between all of the big wins there have been losses and life lessons. There have been many moments that may seem like little moments and gestures for these ladies but to their fans those moments mean everything. A young girl in Moose Jaw after the team lost the Page 3 vs. 4 game at the 2015 Canadian Championship was in tears holding her 'Let's Go Canada' sign in the lounge. Alternate Cheryl Kreviazuk and I spotted her. Cheryl took the young girl by hand and walked her back to the arena dressing room to meet the ladies. Rachel gave the girl a game-worn jersey and tickets to the next game. In exchange the young fan gave them her sign to hang in their dressing room for their next playoff game which they would go on to capture bronze in. Eight weeks ago, before O Canada played at the Canadian Tire Centre, Lisa reached into her curling bag to hand a game-worn Trials jersey to a young junior curler who had attended the team's junior curling camp last fall and sat rink-side at nearly every game to cheer on her curling idols in her hometown. She is here tonight proudly wearing that jersey. For the last couple of years Team Homan has been the number one ranked women’s team in the world and after last season their names are stitched into a banner to confirm that. They're soon to be Olympians. Outside of all of the honours, all-star awards, highlight reel takeouts and glorious gold medals are these little stories that tell more about them as people than any medal or banner ever could. Last week the Canadian Olympic Team posted a video with the following narration, a fitting end to these stories of virtue and grace. Somewhere along the way the true power of sport, that it can transform and unite in a way that little else can, was forgotten. To be victorious no matter the cost is what drives so many athletes. But the Olympics are about more than just victory. Canada is about more than just victory. Because behind this little red leaf are foundations that require us not to be selfish but to be selfless. To set a record and set an example. To win medals and win moments. Virtue or victory isn’t a decision to be made. Virtue is victory. When you’re Canadian they go hand in hand just like we do.